During my summer visit to the United States I heard the expression “staycation” for the first time. Since I had been absent for about a month and a half from Rome for various reasons, this year I decided, before even knowing the term existed, to do a staycation there for my vacation: day trips to places around Rome and relaxing at home. As of this writing I’ve lived in Rome, off and on, for eleven years. As a brother, and as a priest occasionally, I’ve had to opportunity to see the city with family, friends, and pilgrims. I never went out into the city to see things that just interested me; usually I just suggested places to the group I was with and accompanied them wherever they wanted to go. This staycation was the perfect opportunity to visit those little places away from the beaten path that I’d always wanted to see, and to visit some places I’d not visited for a while for lack of an opportunity. This is not a recommended itinerary for people visiting Rome for the first time; there are tons of things that are a higher priority. 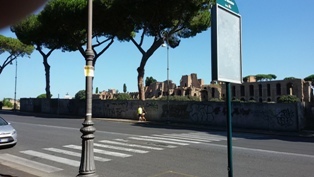 Day 1: The via Appia Antica, Domine Quo Vadis? 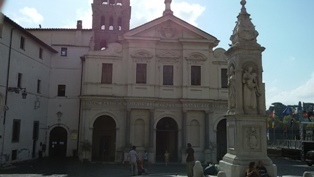 Church, and the Catacombs of St. Sebastian. I drew on old knowledge to find the bus stop for heading out to the area of the Catacombs, and much to my chagrin found out the bus stop had been moved. With the triumph of modern technology I was able to find the new bus stop without losing much time, but then the bus didn’t come…and didn’t come…and didn’t come. Undeterred, I checked on Google Maps how long it would take to walk from the bus stop to the first stop, the Domine Quo Vadis? Church (around 35 minutes), and went walking to it instead. Part of the walk was on the via Appia Antica, closed to traffic, so it was a beautiful, peaceful walk. 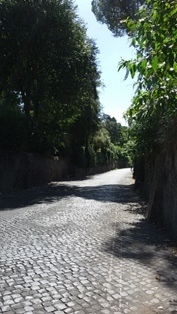 This was probably the road in which Paul was led in custody to present his case before the Emperor when he came to Rome. The Domine Quo Vadis? 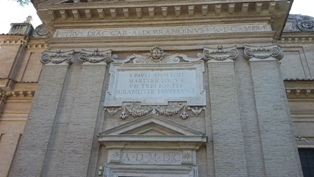 Church is built near the spot where tradition says what when St. Peter was going to abandon the city during the persecution, he saw Our Lord heading into the city, and when he asked Our Lord, Domine quo vadis? (Lord, where are you going), he replied that he was going into the city to be crucified again. Peter got the message and returned into the city. 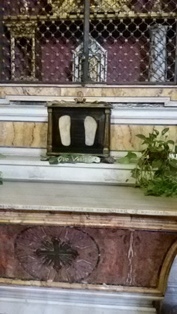 According to tradition the Lord’s feet left an imprint in the stone where he stood; the original is at the nearby catacombs of St. Sebastian (right photo below), and a copy is here. I visited both sets on the same day, not sure which was a copy of which. 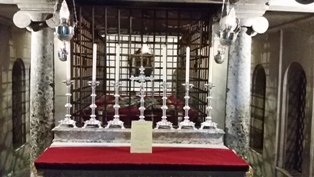 I also prayed at St. Sebastian’s tomb. 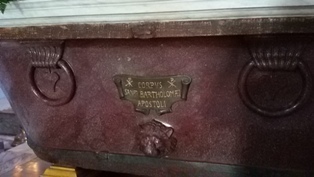 There’s a church in Rome nicknamed the “bone church” because it contains an ossuary with the bones of deceased Capuchin friars from the convent built there. I’d always heard about it, but never visited it. Pictures aren’t allowed, out of respect for the dead, but beyond morbid curiosity that attracts visitors of all stripes (the skeletons and bones are arranged, sometimes artistically), for me, as a religious too, it made me remember how even our bodies are at the Lord’s service in death, and it puts all the grand plans you have for life into perspective. 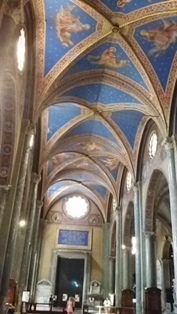 Santa Maria sopra Minerva is a beautiful church with Gothic architecture (a rarity in Rome–I love the blue arched ceilings) and the tomb of St. Catherine of Siena and Fra Angelico (it’s a Dominican parish). 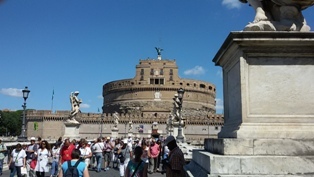 Castel Sant’Angelo is now a civil military museum, but I’d never gone close to it, so I just admired it from the outside. 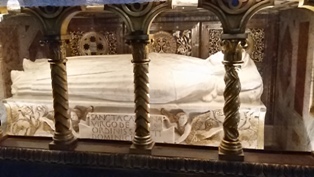 After my trip to Bari a few months ago one of my confreres (a fellow Nicholas) told me about a basilica dedicated to St. Nicholas in Rome, commemorating when he was censured at the Council of Nicea in 325 for denouncing the heretic Arius and reinstated after a miraculous intervention by Our Lord. The basilica had a side altar dedicated to Our Lady of Guadalupe where a special Mass is celebrated on the 12th of every month, and an interested interpretation of the Way of the Cross. Little did I realize that it would set the tone for the morning. It was Friday, and Friday is when we remember Our Lord’s Passion. From there I visited the Holy Stairs (after passing through the Imperial forums) that a tradition says were the stairs to the Praetorium where Pontius Pilate condemned Jesus, and Santa Croce in Gerusalemme, where a relic of the True Cross and other objects related to the Passion are kept, including the titulus, the wooden sign that was placed over Our Lord’s head on the Cross. 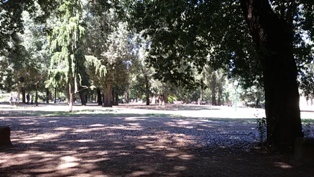 This day happened to be our weekly community day, so we spent the morning walking in the Villa Borghese, a beautiful large park with some fabulous views of the city, and then I orchestrated a lunch rendezvous for the community in a nearby Burger King. 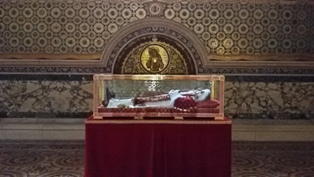 This day I visited the basilica of Saint Lawrence Outside the Walls, which has the instrument of martyrdom of the deacon and martyr, as well as the body of Blessed Pius IX. 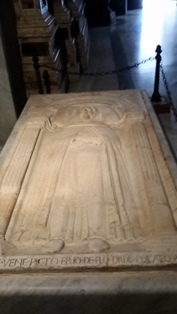 The basilica is on the outskirts of a huge cemetery, the Campo Verano (summer field), with various artistic tombs and monuments. There is a small island on the Tiber river that winds through Rome that is named the Isola Tiburina (the Tiberine Isle) that you can walk onto. 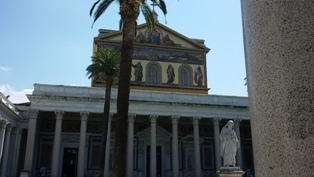 On this island is the basilica of St. Bartholomew, where the bones of the apostle are kept. 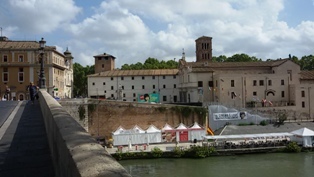 I also walked along the Tiber a few times (up on street level). On this day I walked from our center down to the Piazza del Popolo, which has three churches. I spent some time in Santa Maria del Popolo that has two works by Caravaggio: the crucifixion of Peter and the call of Paul. For my last excursion I went to the Tre Fontane Abbey (Three Fountains), the place where St. Paul was martyred. When he was decapitated, as the story goes, his head bounced three times, and at each spot where it bounced sprang a fountain. A church is now built over the three fountains. Considering Paul’s amazing journeys as an apostle I think it can rightly be considered one of the greatest finishing lines in salvation history: he raced for the crown of eternal life and won it here. It’s a beautiful, quiet place. 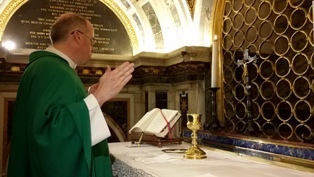 From there I walked to St. Paul’s Outside the Walls, where Paul is buried (under the main altar, as was recently confirmed by archaeologists) and I was ordained a deacon in 2006. Although it doesn’t exactly count as a vacation excursion, a brother asked me to celebrate Mass in St. Peter’s for a couple celebrating their fortieth wedding anniversary (congratulations Paul and Barbara). 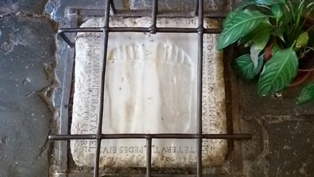 It was scheduled at the Clementine Chapel beneath the main basilica. I’d never said Mass there, and always wanted to; it’s the closest you can celebrate Mass to the place where St. Peter’s bones are located. Paul and Barbara renewed their wedding vows and then treated us to breakfast. It was a great grace to conclude my staycation outings.